We have been in awe of women entrepreneurs for the longest time. Our conversations more often than not would find a mention of the ladies who are running small and big businesses alike and doing a great job of it. The idea of introducing the new (and our first woohoo!) series, "In The Spotlight" is the byproduct of those numerous conversations. So, in the particular series, we will be making conversations with the brands that are spearheaded by a woman/a group of women. To kick off, today, we have Mrs. Himala Palni of 'Tiki-Ah!' in the spotlight. Tiki-Ah! 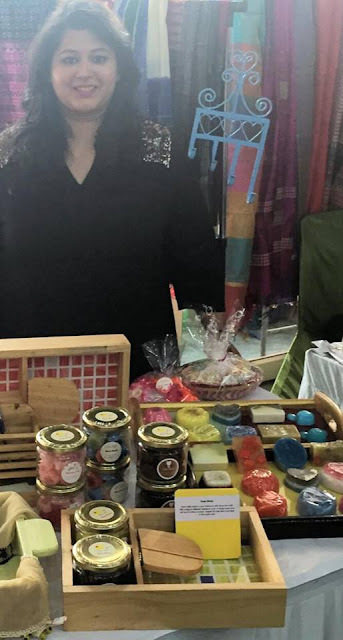 is a personal care products brand based in Gurugram, Haryana. 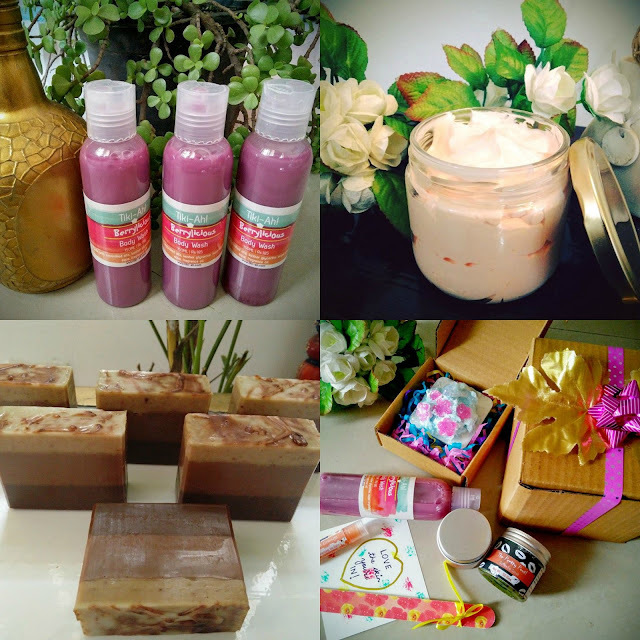 Mrs. Himala painstakingly handcrafts soaps, lotions, face masks and more that are 100% natural and cruelty-free. Goodies from the House of Tiki-Ah! Q: You have a unique brand name. How was the name 'Tiki-ah' conceived, and what inspired you to come up with a brand of your own? A: 'Tiki-Ah! was the result of a 'sham ki chai' conversation with my sister and my husband. I wanted the brand to have a desi appeal and please both the young and the older generation. It was initially named 'Tikiya' but to jazz up things a little and to give it a young, vibrant and fun appeal, we replaced the 'ya' with 'Ah!'. And that is the exact expression we want people to use when they see, use or take a sniff of our products. In all honesty, I was never made for the mundane nine to five job, it bored the hell out of me. I wanted my work to be different every day and a workplace where I could take my dog. Tiki-Ah! gives me both. Every single day is different. I am constantly working out new recipes, playing with different ingredients, designing soaps and when I need a break, my dog is right there for a quick game of fetch. Quitting my job and starting my own venture was one of the best decisions I have ever taken. Q: How would you state your brand's philosophy in a few words? A: Adding a touch of glamour and a rainbow of colors to your daily life, naturally! Q: Why should people be using natural/organic beauty products as opposed to "other" commercial products? A: Commercial products are made in masses for the masses. It is like 'one size fits all'. Also, to reduce production costs, commercial products tend to use harsh chemicals, which are nothing but synthetic imitations of the real things. Natural products, on the other hand, bring to you all the goodness that nature has to offer. They are like 'Dadi maa ke nuskhe' packed and parceled especially for you. A: Remember, you skin is porous and absorbs a good amount of substances applied on it. Read the ingredients carefully, do a little bit of research yourself and you should be good to go. Q: Why do you think people are steering towards green beauty products these days? A: A lot of awareness has been created around sustainable living, natural lifestyle and being eco-friendly. It is good for you as well as the planet. A total win-win game! Moreover, people have started realizing the long-term side effects of using synthetic products that eventually lead to bad health and are now making researched and informed decisions. Choosing 'natural' is the way to go. Q: What are your favourite ingredients to work with? A: I love Cocoa butter. It is skin-loving, versatile and extremely nourishing and to top it up, it smells of chocolate, and who doesn't love chocolate! My second favourite has to be sweet almond oil. It is a very light oil that absorbs really well into the skin without giving it a greasy, coated feeling. It is a part of a lot of Tiki-Ah! 's products and the customers love it! Q: If you had to recommend your top 3 beauty products from your brand, which ones would they be? A: People are crazy over our 'Coffee Chaska' Tiki-Ah! It is our top seller followed by the anti-ageing face mask and the 'Berrylicious' body wash.
Q: Where do you see Tiki-ah in next five years? A: In everyone's bathroom! We want Tiki-ah to be in your make-up kit, on your dressing table, in your handbag and be a vital part of your daily life. Deepika recently hauled some products from the brand which you can see HERE. Deepika would be reviewing some of the products real soon so stay tuned. To place orders, please head to brand's official website HERE. Our Recommendations: Berrylicious and Oh! So Minty Body Washes. We hope you enjoyed reading our tête-à-tête with Mrs. Palni as much as we enjoyed asking her these questions. We have lots more such tête-à-tête to come so keep your eyes peeled on our blog and social media platforms. Disclosure: The opinions expressed above are interviewee's own and the pictures were used after seeking permission from the brand.